I haven’t been familiar with Glyder from Ireland, even though Backroads To Byzantium is already their fourth studio record. The title does the album justice, as the music is definitely going back to the Eighties and even the Seventies. There have been a couple of line-up changes, most importantly singer Jackie Robinson who has already been compared to Phil Mogg (UFO) and Paul Rodgers (Free, Bad Company). Furthermore band leader and guitarist Bat Kinane also hired a new drummer and bassist. The aforementioned comparisons give a good impression of what to expect: classic rock and hard rock the way it was popular three to four decades ago. On the opener Chronicled Deceit, I hear parallels to Whitesnake and Led Zeppelin. The following Long Gone is the CD’s highlight: the more glam oriented sound is not unlike Kiss. On Even If I Don’t Know Where I’m Gonna Go, the band pays tribute to its Irish roots, with the two guitars reminding not only a little of Thin Lizzy. And I wouldn’t be surprised if Blue Öyster Cult hasn’t influenced End Of The Line. These songs are all quite simple and full of clichés, but their retro factor works its charms on the audience. Unfortunately not every track is up to that standard, and three songs can even be called weak. All of them are quieter pieces that don’t work so well for the band. Especially the concluding Motions Of Time is rather banal and just as insipid as a ballad by Extreme. 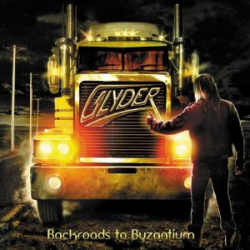 Those of you who grew up with Seventies and Eighties rock should like some of the tracks featured on Backroads To Byzantium. The younger generations might have harder access to this kind of classic rock though.